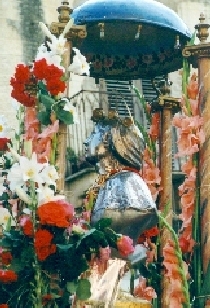 Santa Rosalia, clearly holds a special place in the hearts of many Sicilians, who have affectionately nicknamed her La Santuzza, the little saint. During the first week of June every year in Santo Stefano Quisquina, there is a special celebration to commemorate her miraculous intervention that saved Palermo from the Black Plague. Rosalia was the daughter of Duke Sinibaldo, Lord of the Quisquina and the Roses, who was a cousin of King William II of Sicily. Like Saint Francis of Assisi, Rosalia turned her back on a life of ease and chose to devote herself to prayer and solitude. The legend says that in 1159 she retired to a hermetic existence in a remote cave on Monte Pellegrino, the rocky cliff high above the Bay of Palermo. Nothing was heard from her again until 1624, when the plague arrived in Sicily. Salvation to Sicily came in the unexpected form of La Santuzza, who appeared in a vision to a hunter lost on Monte Pellegrino. "Don't worry," she said "I will protect you and I will protect the city". She revealed to him the site of the cave in which she had lived as a hermit and told him to go back to Palermo and alert the archbishop and rulers of the city. The hunter did as he was instructed, and those leaders found her remains and displayed them through the streets of Palermo. Within three days, the plague ended, and she was proclaimed patron saint of the city.